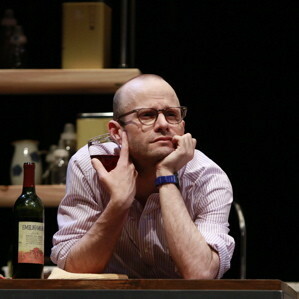 Nick Garrison’s acting career Seattle shifts easily from drama to musical to comedy. Whether he’s cavorting in Rocky Horror Picture Show or spouting Shakespeare's poetry, Garrison delivers the type of performances that often steal the entire show, while completely serving the play and supporting the rest of the cast. He won critical acclaim in the titular role in Hedwig and the Angry Inch — which was called “Liberace-on-meth” when he repeated it in Chicago to award-winning results — as well as performances at Seattle Repertory Theatre, Intiman, The 5th Avenue, The Empty Space, Strawberry Theatre Workshop and numerous appearances at the Re-Bar. In This, which plays through May 15 at the Rep, he plays Alan, the proverbial third wheel in the complicated friendships of its angsty protagonists. Like many in Seattle, I tend to think of you as a singer or a singing actor—but your non-singing list of roles is extensive too! What's harder to prepare? A straight dramatic role like Alan in This or something that includes music? All roles have their challenges, I suppose, but anytime you have a musical element in a play it's a bit more of a challenge. I always feel a musical role demands all of what you have to offer as a performer and you really have to be at the top of your game to make it appear effortless. Having said that, I really feel playing Alan has utilized everything I have as an actor and has been incredibly rewarding because of that. What draws you to a character like Alan? The appeal of playing someone like Alan is the freedom of getting to play a person who really does not censor himself, has an abundance of wit, and throws himself into the events of the play full force and with great passion. There was no real road map for how to play this odd, quirky person so I really had huge amounts of freedom to create in rehearsal (and in performance now) and that is really great fun! I love the final moments in the play where Alan is juggling a baby, pouring a glass of wine, and trying to calm down his screaming friends. What's your favorite moment in This? I have to say I really love those final moments as well. There are great payoffs for the character and the play and I tend to love any kind of scene that requires a lot of physical comedy and pathos at once. I am also a fan of the scene between myself and Jane (Cheyenne Casebier) on the sofa in her apartment, mainly because I'm a big fan of Cheyenne and I love getting to play with her every night. You've appeared with so many companies in Seattle. How do you describe the Seattle theater experience when you're acting elsewhere? I always talk about Seattle being a true theater community where everyone knows each other and really does support each other, when push comes to shove. I think of Seattle actors as being real rock stars, able to fend for themselves and make awesome work with next to nothing. I always miss Seattle when I'm away! My next project is directing the Caryl Churchill play Cloud 9 for Strawberry Theatre Workshop with an all star cast (Sarah Rudinoff, Ian Bell, Gretchen Krich, Imogen Love, James Cowan, Scott Shoemaker...the list goes on) and then I am acting in a few upcoming things but I am really most excited about playing the wicked stepsisters in Cinderella at The 5th Avenue with my beloved Sarah Rudinoff. That will be ridiculous fun!